Operation Christmas Child - Part1! Ambrose has asked for Tom's help to carry these shoe boxes. The vicar asked a local shoe shop if they would let him have any spare shoe boxes that customers didn't want to use to take their new shoes home. Ambrose agreed to go to the shop and pick them up! Poor Tom can hardly see over the top of HIS box can he? Ambrose is VERY pleased to be relieved of his shoe boxes! Who have we here? It is Priscilla Jane. She knows that she and all the other children are going to be taking part in a project which involves the use of shoe boxes. So she decides to have a rummage through the shoe boxes that Ambrose and Tom had brought from the local shoe shop. She has just spied THE very shoe box for her! And it has a beautiful picture of a pair of pretty pink high heeled shoes. She decides that this box with pink shoes on the lid is to be HER very special shoe box! Oh dear...Tinker seems to be wanting attention from Priscilla Jane.........perhaps SHE wants to take part in this new exciting project and be given his own special shoe box too. The vicar has brought along some leaflets to give out to the children to explain to them and their parents what the "Operation Christmas Child" project is all about! Poor vicar! He has to tell the children that he has developed arthritis in his arms and cannot hold the leaflet up for them all to see properly because it is too painful. So he has asked Ambrose to hold it up for them to see instead. Can you see a pair of mice somewhere? Ah.........there is one mouse, namely the church mouse, Nunc Dimittis and his pal, Snowy mouse, each having a little sniff and chew of each of Ambrose's shoes! Naughty mice! Don't they realise that Ambrose' father is not very well off and can't afford to buy him a new pair of shoes very soon! We hope they don't chew a hole in them! 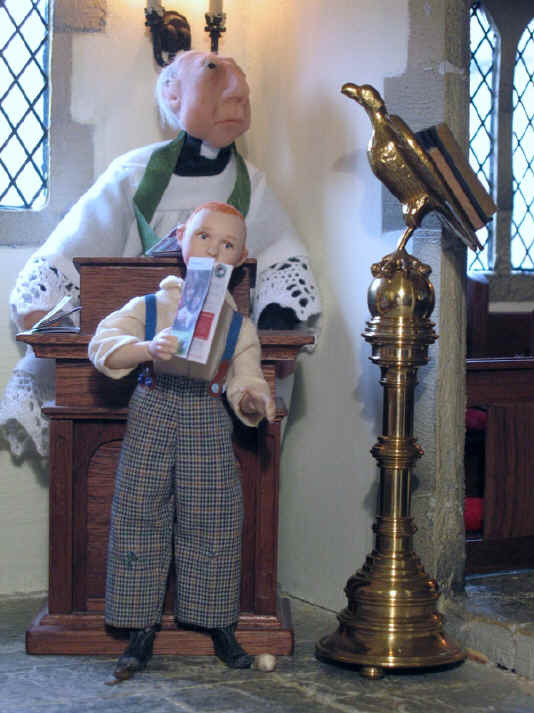 The children are now gathered around the vicar to see the leaflet Ambrose is holding better. 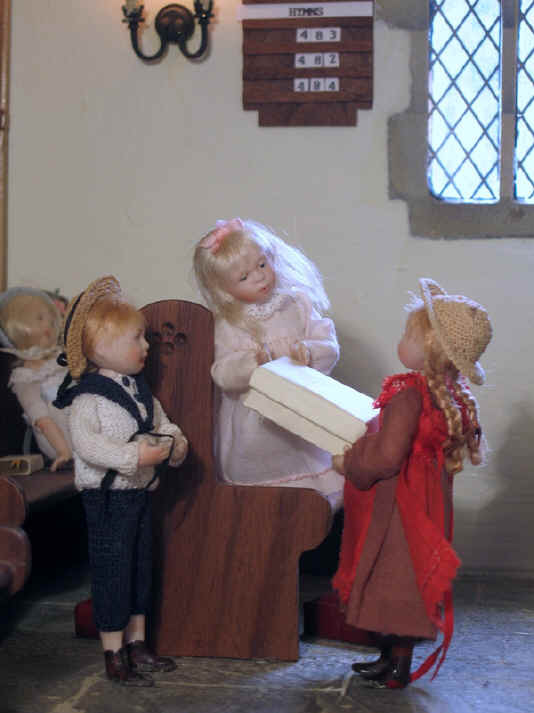 The vicar explains that they can all take a shoe box home. They must choose whether to make it a gift box for a girl or a boy. They must also decide what age range they will buy gifts for. There are three different ranges, 2 - 4 years, 5 -9 years and 10 - 14 years old. 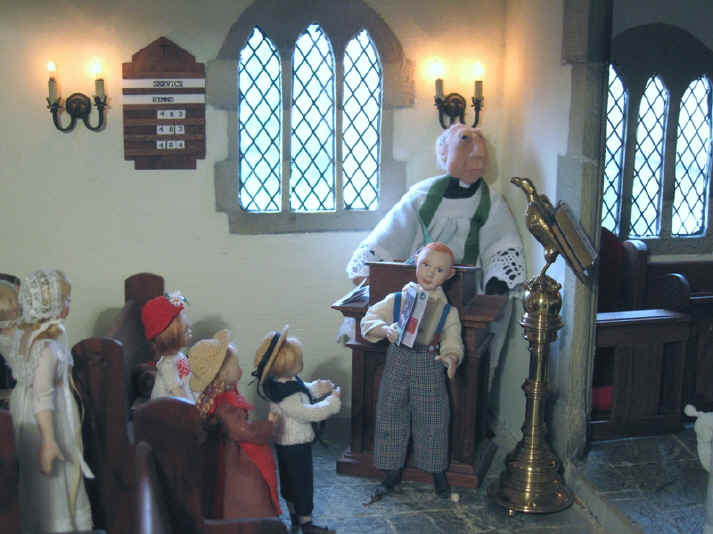 The vicar suggests that they pick the range 5 - 9 years because they are all in that age range themselves and will be able to think of the right kind of gifts to put in their shoe box. The vicar further explains that there are strict rules as to the nature of the gifts. He says that there must be one hygiene item like, for example, a toothbrush, comb etc, something to love like a toy, ball, truck, doll or car, something educational like a colouring book or crayons/pencils and lastly an item that can be anything else like sweets, gloves and scarves. He also tells them that there is a list of things NOT to put in the box like, for example, chocolate, as it would soon melt if the child lives in a very hot country! The children are really excited and are dying to take the boxes home and buy gifts to put in them. Oh dear..............poor Priscilla Jane is just showing off her VERY special shoe box with the pretty pink shoes on the lid to Tom when who comes along but Adele! Adele decides to interrupt Tom and Priscilla Jane as they are chatting and demands, "I WANT that box - why should YOU have it?" Priscilla Jane is immediately very upset and tells Adele that SHE saw the box first and she likes it because the pink shoes match the pink of her dress! Tom is extremely upset to see his two friends squabbling and tells them off. He tells them that it is ONLY a shoe box and he is sure that they can find another box that is just as nice for Adele. Almost immediately Adele realises how silly she has been because the shoe box is not even going to be HER box anyway because another child less fortunate then herself will have it to play with. Good boy Tom for helping his friends make up and be friends again. Good boy Ben! 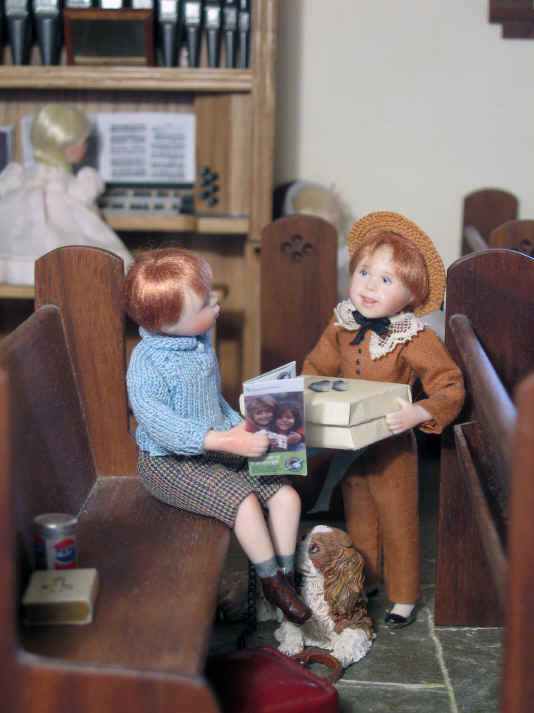 He decides to help the vicar give out the shoe boxes and leaflets to the other children. Robert Alexander looks pleased to have his shoe box. Good to see that he is not at all worried which shoe box he is given. But Robert Alexander is a very relaxed boy and takes things in his stride. Georgie, his ever faithful pet dog, is by his side today and that is all that matters to Robert Alexander! Oh dear though........WHO has been drinking a can of Pepsi? Visit our "Operation Christmas Child Part 2" and find out what gifts the children chose to buy for their shoe boxes! Many thanks to Jim's Dollshouse Pages for the shoe box template.